Note: For all map points of nameds in Fear Itself (for "thuledream.txt" map files), see this quest entry. 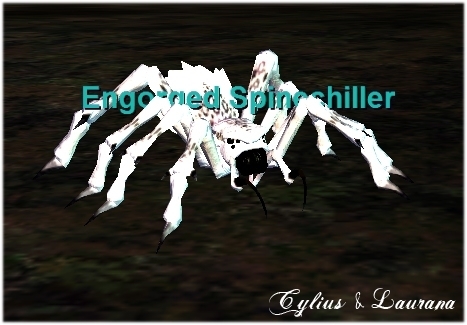 The Engorged Spinechiller spawns from roaming spinechiller mobs near the zone-in area. It hits for a max ~10,500. This page last modified 2014-09-12 10:53:21. Dropped Leather Gloves of Overkill for me today on 3rd repop. Note that the spell this mob casts includes SILENCE. Dropped a big fat Scuffed Journeyman's Pocketed Rucksack for me today. Went through about 6 hours of placeholders before it spawned, I'd say it was worth the wait. It cast Spine Chill and Phantasmal Transformation. My parser had him at 873k and 879k for hit points. Also drops Ambiguous Remnant of Truth, received today (12/09/10). Spawns at the entrance of zone just kill spiders until it pops..